Christmas is not far away, but my family is. I’m homesick, but that won’t keep Christmas from coming. Even though I’d rather be with family, being away has led me back to true celebration. In the midst of loneliness, I’ve found some new ways to cultivate my little Advent heart. Three weeks after arriving in Indonesia, it somehow both feels as if I have done everything and nothing. As an expat learning to live in a new country, I’ve done everything. Get a cell phone number. Order a Grab (the Indonesian version of Uber). Learn how to get to the grocery story. Eat lots of new foods. 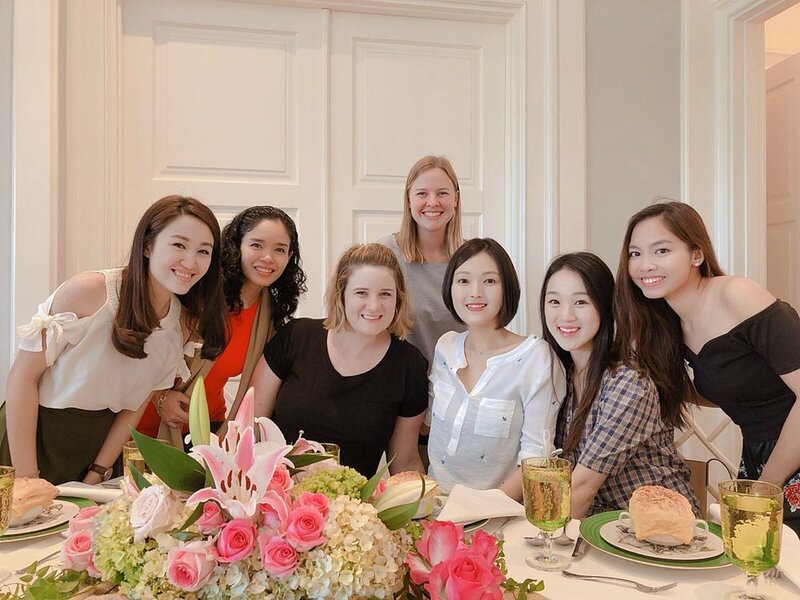 Lunch at the Riady's home with all the new gals. Yet, as a tourist, I feel like I’ve done nothing. I’ve done very little sightseeing. Learning life has consumed the majority of my time. To me, as an impatient adventurer, this is a little frustrating, but I know that it will all come with time. The Asian games are coming in a few weeks and October break will bring all sorts of excited! In lieu of recounting any thrilling tales of my first weeks in the East, I though I would share a few small moments that help color the picture of my new life in Indonesia. While I hear that Indonesia is home to komodo dragons and rhinos and orangutans, most of my experiences with the local fauna has been on a smaller scale. In addition to the more exotic creatures, Indonesia is home to a veritable smorgasbord of creepy-crawlies. Ants, lizards, spiders, beetles, snakes, scorpions, bats, mosquitos… Normally, I’m not a person to be too bothered by otherwise icky creatures (with the exception of that snake in my kitchen one time). It’s the way that these little guys sneak up on you that gives me the heebie-jeebies. Someone wisely told me “it takes a lot more work to keep things clean here. You really have to work really hard to keep the bugs away.” She was right, but even with excessive tidiness, the lizards seem to be unavoidable. They do eat the bugs so you start to not mind them so much. There are two kinds of lizards here. The little brown ones that are tough to catch and skedaddle every which way and the Tokay geckos. 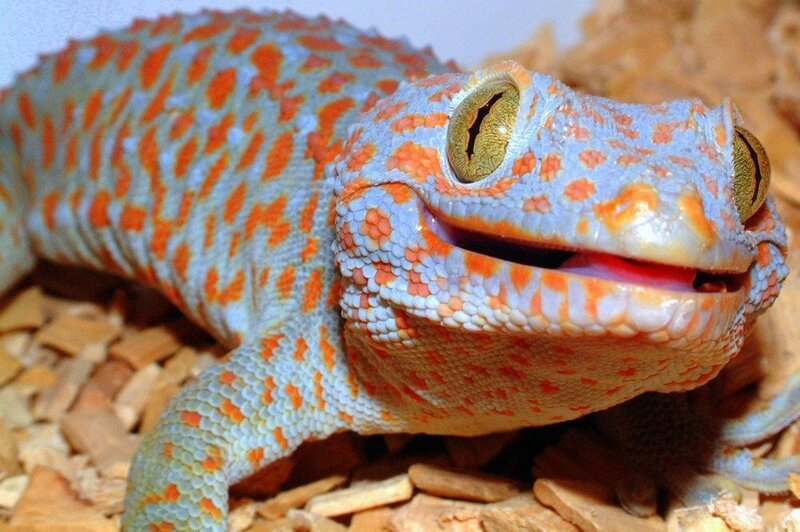 Tokay are named after sound they make ("to-kay to-kay") . They’re a blueish-brownish color with orange spots and are very noisy. One family here told me that they have bunch of them living in their air conditioning unit (I did see one pop his little foot out from behind it other day). I don’t think I have any Tokays but I do have the tiny ones. They are equal parts endearing and a nuisance. The other day, I was hanging a map on the wall with some double-sided tape. Feeling pretty successful, I put the roll of tape down on the floor and headed off to bed. A day or two later I finally went to pick up the tape. Maybe some of you who are more logical than me can see where this is going. In near darkness, I start to roll up the tape on the ground. There is something gummy attached to it. I keep tugging at it until part of it came loose from the tape. Could it be gum? Did I step in something? Nope. Poor little lizard stepped on the tape, got himself stuck, aaand he died there. And that little bit that came loose? His tail. Yep. I had ripped his tail off. I’m sorry, lizard but not that much. Let’s remember, it was you who broke into my house in the first place. Pray for health. Pray for continued adjustment. We are currently at t-minus 14 days. Soon, I’ll be touching down on the Jakarta tarmac and beginning a new chapter! I just feel like I'm in a weird state of limbo. Somehow, I am trying to downsize and get rid of everything I own. Yet, I'm still purchasing every sort of essential that I’ll need to take with me. I think the UPS guy is getting throughly sick of me. He had to deliver four packages to the doorstep yesterday. Before I go, I thought it would be good to answer a few frequently asked questions just to help provide some context. Here are some things people have been asking me. I will teaching at Sekolah Pelita Harapan, a group of international schools in Indonesia. All five of the schools are are located in and around Jakarta, Indonesia’s biggest and capital city. I will be teaching at the Sentul City campus which is located farther out of the city in the more mountainous area near Bogor. This is an old map, but it should help you visualize just the same. Yes! I'm scared of sticking out like a sore thumb. I recently found out that I am about a foot taller than the average Indonesian woman. Yikes. There is definitely a strong fear of not being able to communicate or committing some awful cultural faux pax. Things I can't control have never seemed to phase me too much, though. So, if you're asking if scared of tsunamis and terrorism, I guess the answer is "eh, not so much." I guess I seem to lack a healthy caution. Bad things happen can (and do) happen anywhere. Rather than dwell on they hypothetical, I'm trying keep a healthy attitude that is careful and prudent but still excited! Me currently. Equal parts cautious and optimistic. So, you're teaching English. Right? For some reason, everyone thinks I am teaching English as foreign language, but I am not! SPH is an international school, and English is the language of instruction. I'll be teaching all core subjects in a fourth grade classroom––just like I would be here in the States. There are over 700 languages spoken in Indonesia with Bahasa Indonesia being the most common. Students also learn Bahasa, but thankfully I won't be having to teach that! I've been trying to practice picking up a few words and phrases and haven't had too much luck yet. Other teachers have told me that it is not a difficult language to learn. I really hope they're right. How does your family feel about you moving so far away? I know that I will miss them sorely and I imagine that they feel the same way. They're a good bunch, those Royces. Holidays will be the hardest. Just more reason for them to come visit me even sooner. There are some incredible looking airbnbs in Bali! Really, I think they are excited for me! Fortunately, we've all gotten to spend some quality time together before my departure. Last week, we went out for my birthday, and all the gals saw Les Misérables on tour. It's been a great sendoff. Pray for safety. Pray for adjustment. Pray for comfort.